From 2014 to 2017, tithing to the church via Pre-Authorized Debit (PAD) has grown from 38% to 44% of the total income received at WSG. Convenience – Give any time even when you are not at church! You fill out a form and include your information and we take care of the rest for you. Control – You are the boss. You choose when you give, what to give and to which budget you would like to give. And, you can modify your giving at any time. 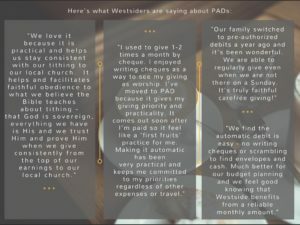 Commitment – Using PADs not only helps you to incorporate it in your own budget but also helps WSG to make informed financial decisions in preparing the budget. Simple. Convenient. Click here to start today!